It seems to be that bitcoin cash has these excellent features and can completely eliminate bitcoin in function. But bitcoin is not a simple virtual coin, it has a certain symbolic meaning, it is the banner of this encrypted currency group, it is irreplaceable! Funny they once said the roman empire was irreplaceable, guess what they were wrong. LOL. Time cares little for what they think as history keep proving. The Roman Empire did not die. It lives on today at the Vatican. Warning: Trade with extreme caution! " I don't wanna piss any people off. But I sit here and wonder what is the purpose of Bitcoin? All I see it being used for is investing/Trading and trying to make money off of it like a commodity, all I see is it being manipulated by china and mining. What real world purpose does this coin have? Is it scale-able for everyday use? I just feel like slowly there are better and better options out there. Bitcoin Cash just makes so much sense to me. I'm not an expert in crypto and its economics but I have a hunch that majority will switch from Bitcoin to Bitcoin Cash, I just think its a matter of time. I'm personally all in on BCH, this could be disaster but I just feel like Bitcoin is Henry Fords Model T and new better versions/models can't be stopped, maybe its time to adapt to something new. Honestly, the only reason I ever purchased any bitcoin was to fund other Alt coins...now that Litecoin or Ethereum and Bitcoin Cash is available on Coinbase I will probably not ever buy it again. Don't believe the HYPE! BTC trans. confirmed in 22 minutes, BCH took 3 HOURS!!! So I decided to do a little test yesterday and send a BTC transaction and a BCH transaction at the same time. Just to make it interesting and give BCH an unfair advantage I decided to set the BTC fee at half the reccomended amount, at around 500 sat/byte. The estimated time for confirmation was 25 BLOCKS or more than 14 hours. Guess how long the low-fee BTC transaction took??? 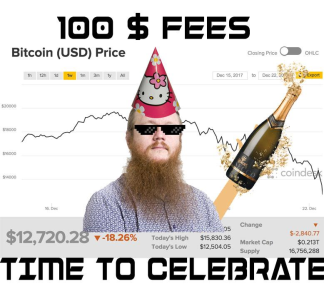 Which means that the high fees listed and the unconfirmed transactions (made up of spam from the tiny cabal of Chinese BCH backers) is PURE FUD! Bitcoin still does fast and cheap transactions and works like a charm. ahahaha I almost gave up but it eventually got there. What a joke. Cheap, instant transactions? HA! BCH has a tiny, crappy network and a hacked virus-filled "Electron" client that will send your BTC address directly to you-know-who if you don't empty it first. Oh well. At least we can all dump this Chinese knockoff BCH and get a nice free profit from those suckers trying to pump it up. Yet another alt-coin fail, bye bye BCH(inese). so there you have it Btrash can sook a big one. In the speed of transaction the winner is BTC for sure, while Bitcoin Cash is less expensive. Nevertheless I think BitcoinCash did more harm than good as he brought some FUD into previously solid community. Ridiculous - over the past 3 years Kore and their trolls KILLED the community with ridiculous arguments (which are now in the graveyard of stupid failed ideas) and ad hominem attacks to get rid of the few sane developers we had. Right now we're busy working together to rebuild the community with a coin that works - Bitcoin Cash. Greg Maxwell is drinking "champaign" thinking he won when he failed colossally. Properly designed, working technology shouldn't require "faith" that some under-defined, under-evaluated technology will magically arrive one day and make it work again. Face it, you pushed for a broken vision, got your way, and failed in exactly the way everyone said you would. Bitcoin cash price down while the bitcoin price down long time , i think bitcoin stuck transitions , trader cannot deposit btc on exchange so bitcoin cash down too. Now this is best time to buy bitcoin cash with low price . If maxwell is Lauda that explains a lot. What a grotesque loser. protectionist alliances/ measures are often seen after the downgrade in the quality of an issue. Does Lauda/ Maxwell even understand that hope for betterment quote? Sometimes hope that people understand the meaning behind the words they assemble is wasted too I guess..
~ In the top jural societies of scale the "judiciary in rebellion" model seems to be the 'in vogue' pressure relief option though all of recorded history says the surest way to peace on earth is the other direction for the nation state. What is good for the nation-state is supposed to be good for the family of nations just like what is good for the man and woman and family unit is supposed to be good for the nation state. To see rebellion be embraced as a business model should be concerning.. Ya'll expect something that is barely used to rise ? Everyone wants to trade cryptocurrency but which one of u actualy realy uses it ? I think this is the main problem. Sure, there are options to use this currency but its used minimaly. System of this thing is kinda broken.. Everyone wants to hold their currency but no one is willing to pay with it because they expect it to rise. What are your thoughts on this ? Holding is what investors do (long term), selling and buying on different time frames is what traders do, miners just don't care about the price action, they'll sell to whatever the price to pay their bills.